Buying healthy food is only half the battle. You also need to cook it the right way! Here are the tips you need to prepare healthy meals. If you've made the commitment to eat healthy this year, congrats! You're doing something that will have huge, long-term benefits for your overall health and physique. The commitment to eat well, however, can be a little tough when you haven't spent lot of time in the kitchen. If you don't know how to cook, how are you supposed to eat healthy? Don't give up on your clean-eating resolution just yet! Six ultrafit MusclePharm athletes have come together to share some of their favorite clean-cooking tips. They're not trained chefs—just people who have committed to living fit. Put their ideas into practice, and you'll be eating more healthfully in no time. Cooking oils are a kitchen necessity, but they can be a little difficult to measure. "I tend to overpour oils," says MusclePharm athlete Alyssa Smith. "I switched over to a cooking spray, which helped decrease the number of calories I was consuming." If you usually douse your pan in oil before you throw in your chicken, try some spray instead. You'll undoubtedly use less oil and ingest fewer calories. Smith's latest favorite cooking spray is coconut oil. This is a great choice for a cooking spray because it's a healthy fat with great flavor and a high smoke point, meaning it can withstand high heat during cooking. Many Americans consume far too much sodium. What with our reliance on fast food, frozen meals, and prepackaged snacks, it's no wonder that people routinely blow past the recommended limit of 2,300 milligrams per day. If you've already committed to a healthy nutrition plan and have cut out some of the sodium-laden foods mentioned above, your sodium intake is probably much lower than the recommended limit. You can incorporate naturally sodium-free herbs like rosemary, garlic, and oregano for further flavor. However, if you're looking to take it to the next level, consider cleaning out your spice cabinet. Smith recommends using salt-free seasonings, which may come in handy if you're preparing for a show or photo shoot, as you will have the most control over your daily sodium intake. "There are a number of products that have lots of flavorful options, so you don't have to be stuck with bland meals," says Smith. You can also incorporate naturally sodium-free herbs like rosemary, garlic, and oregano for further flavor. If expensive food is the primary reason your meals aren't as healthy as they should be, you need a little lesson in grocery-store thriftiness. Clean eating doesn't have to be pricey. "Eating healthy can be much less expensive if you check your grocery store for weekly coupons, always buy in-season produce, and find food that's on sale," says Smith. Sure, being conservative with your hard-earned money might take a little extra work on your part, but that extra time translates into extra cash in your pocket. Smith also recommends buying chicken in bulk and keeping it in the freezer. When you have the food on hand like this, you won't have to visit the grocery store as often. Seek out grocery warehouses, if possible, to save big on big portions. One of the best ways to add healthy volume to your meals is to throw in some green vegetables. "Vegetables like broccoli, spinach, and kale add lots of micronutrients to keep you healthy and fiber to keep you full," says fitness competitor and MusclePharm athlete Kyla Ford. "Add a handful of spinach to your morning protein shake or afternoon meal," she suggests. "It makes you feel like you're eating more without adding a ton of extra calories." "Vegetables like broccoli, spinach, and kale add lots of micronutrients to keep you healthy and fiber to keep you full," says fitness competitor and MusclePharm athlete Kyla Ford. MusclePharm ambassador and cover model Noora Kuusivuori agrees: "More vegetables in your diet will help you stay hydrated and keep you feeling full while also providing essential nutrients such as vitamins A and K.
Even on my most strict contest-prep diets, I never limit the amount of green vegetables I eat. In fact, I tend to eat more when I want to lean out," she says. "Some of my favorite ways to add these vegetables into my diet is to mix up a big salad at the start of the day or add some sliced peppers and onions to an omelet." Ford also knows that preparation is key to staying on track. Even if you're busy, there's usually a way to fit meal preparation into your day. "Take 1-2 hours 2-3 days a week to plan your meals ahead of time," she says. "If you can't answer the question, 'What's for dinner tonight?' you need to work on your planning," says Kuusivuori. "Decide on a week's worth of clean-eating recipes so you don't get stuck feeding the family a boxed meal containing processed or powdered who-knows-what. I like to do my grocery shopping and meal prep on Sundays so that those busy weekdays don't throw me off." Ford and Kuusivuori agree that people who try to stick to a healthy nutrition plan without proper preparation are more likely to fall into their old habits, especially when they're busy. 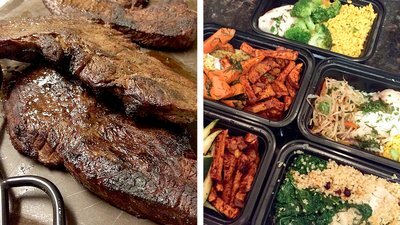 If you're serious about good nutrition, plan and prep some meals ahead of time! Cooking ample amounts of food to last you a few days is key to helping you stay on track. That's why NPC bodybuilder and MusclePharm athlete Andre DeCastro turns to grilling. "It's best to bake or grill your protein sources so you can cook a lot at one time," he says. "By preparing multiple servings of protein at one time, you know food is ready at your convenience, saving you time and money," says DeCastro. All that's left is to heat and eat! Team Bodybuilding.com athlete and MusclePharm ambassador Raynor Whitcombe likes to decrease cooking time by cutting his chicken into smaller pieces and cooking them in olive or coconut oil. "As I cook, I set the heat between low and medium so the chicken is cooked without burning. I also add a sheet of foil over the chicken to keep the steam inside, which keeps the chicken tender and speeds up the process." "Healthy eating is not just about how you prepare your food, but how you select it," says record-holding weightlifter Derrick Johnson. Today, so many additives and chemicals are added to food before you see it. Johnson chooses grass-fed beef that is free of antibiotics, hormones, or added injections. "Grass-fed meat tastes better and offers more omega-3 fatty acids than grain-fed meat," he says. Choosing organic or grass-fed options will provide you with a cleaner food right from the start. Although a low-fat diet isn't necessary for fat loss, some people prefer that approach. If you're one of them, Whitcombe has a tip: "Eat hardboiled eggs." "You won't have to use any oil or butter to prepare them, and you can easily toss the yolks if you don't want them," he says. Without the yolks, eggs become a fat-free protein source. They're also a fast and relatively cost-effective source of protein, so they're great for any diet plan based on clean eating. Even on a low-fat diet, getting enough healthy fats for your body to function properly is essential. "A lot of people are still holding on to the notion that eating fat makes you fat, but it's not true," says Kuusivuori. She recommends eating healthy fats multiple times per day. "I like to top my salads with avocado or toss some walnuts or almonds into my stir-fry," she says. For a clean snack, she likes to add coconut oil to smoothies or smear nut butter over a piece of fruit.